NBC 6's Julia Bagg has more as travelers returned to Terminal G on Monday despite the shutdown. 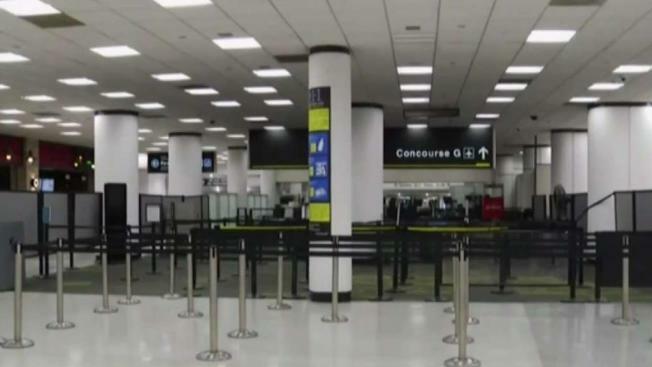 Miami International Airport's Concourse G returned to normal operations Monday morning. The airport said that the decision to shut down the terminal was a "precautionary measure due to uncertainties created by the lapse in federal government funding." Concourse G will close at 1 pm on Sunday. However, the closure at the terminal will end sooner than expected. "MIA’s Concourse G will return to normal operations on Monday morning, with the TSA fully staffing the Concourse G checkpoint. MIA and TSA will continue to monitor checkpoint staffing levels and make adjustments as necessary," the airport said in a statement. MIA said it did not anticipate a significant impact to flight schedules or the overall passenger experience. The Transportation Security Administration – tasked with guaranteeing U.S. airport security – last week acknowledged an increase in the number of its employees calling off work during the partial government shutdown. MIA urges travelers to arrive at least two hours ahead of a domestic flight and three hours for an international flight. TSA employees are expected to work without pay during the shutdown because their jobs are considered essential. Friday marked the first missed paycheck for about 800,000 federal employees furloughed or working without pay – causing anxiety and frustration for many. The union representing the United States’ air traffic controllers is suing the Trump administration over pay that has been frozen as part of the partial government shutdown.